Artichokes have always been a big favorite of our family. We never seem to tire of them. The enormous ones in the market this week were too beautiful to pass up-- they looked like PEONIES! I grabbed a bunch thinking of the Roasted Artichokes I made last year. That method was excellent, but getting the timing right seemed elusive, and they made a pretty big mess, so I hunted around for inspiration. I found something like this on YouTube--I was attracted to the ease and neatness of the preparation- But the taste was superb, and the artichoke flesh came out soft and creamy- out of this world! I have to say, I very much doubt that I will ever, ever, ever make them any other way. To be conscientious, I should note that some people believe that we should not be preparing our food in such a way that it is in direct contact with aluminum foil. Hey, I don't want Alzheimers, and I assume you don't either. So, if this is a concern, consider doing this with a layer of parchment paper next to the artichoke, then the foil over that. I tested it and it works fine... maybe even better. 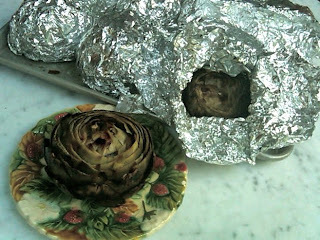 Tear off two sheets of foil per artichoke, or one sheet of parchment, and one of foil, each one about a foot. Use heavy-duty foil. Using a sharp (serrated) knife, cut off stem and the top 1/3 of thoroughly washed artichoke. Drizzle with a couple TBS olive oil, Sprinkle with salt. 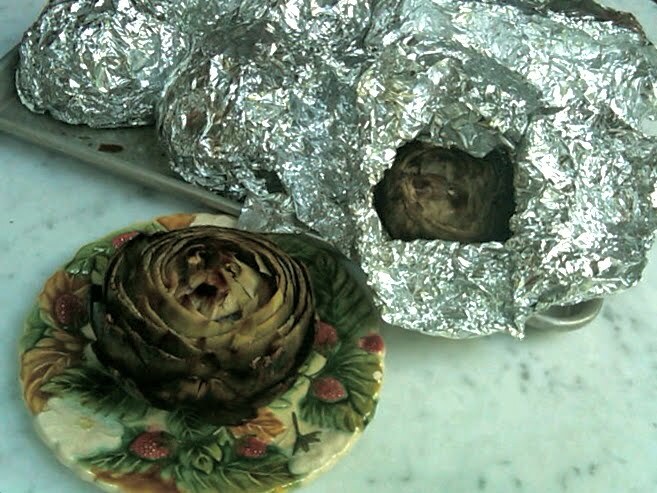 Close the foil tightly around the artichoke, and wrap again in the second sheet. Roast the artichoke "softballs" in the oven for 1 hour 20 minutes. Remove from oven, and be smart enough to let the packets cool until they can be handled. Serve the artichokes hot, room temperature, or cold. They will keep well, and can be made a day in advance. For keeping, I would probably keep them wrapped in the foil, in contact with all the delicious juices. put the garlic, egg yolk, mustard, lemon juice, and salt in blender or food processor and puree until smooth. If you do not have a blender or food processor, whisk the ingredients together in a bowl. Slowly drizzle in oil, drop by drop, with the motor running and puree until aioli thickens (should take 2-3 minutes). If you are using a whisk, keep beating while very gradually adding the oil until the aioli is thick—this will take several minutes. Season to taste with chipotle, and lemon zest. Refrigerate until used-- the aioli WILL THICKEN quite a bit. Leftover aioli can be refrigerated for 2-3 days. Try it on a turkey sandwich!